“Why is aïoli so popular with our diners?” I wondered aloud at work one day. “Just Add Aïoli” is our staff motto whenever we want to turn something on the menu into a hot seller. It’s the comfort-food angle we work when our clientele wearies of inventive preparations or dishes that require a foreknowledge of Europe’s culinary landscape for interpretation. Let me explain. Aïoli and mayonnaise are not the same. Traditional aïoli is a smooth Provençal sauce of olive oil and mashed garlic bound with bread and egg yolk. The amount of garlic in aïoli could be considered medicinal. Enjoy a meal in which aïoli plays a part, and the bulb’s aroma will drift from your every pore. Mayonnaise, on the other hand, is just emulsified egg yolk and vegetable oil, with a little vinegar, salt, and pepper. Mayonnaise is like chicken: satisfactory on its own, yet a bit plain. This quiet, garlic-free sauce stands out as an especially fine host to whatever seasonings a cook cares to add. Garlicky aïoli is too strong to be truly versatile, but mayonnaise is marked by balance. The tart, salty, and slightly sweet smoothness of mayonnaise makes for one of the more addictive edible fats. Name a summer setting, and homemade mayonnaise is your helpful friend. It’s a condiment, sauce, or the basis for a salad dressing. It’s good with vegetables you’ve roasted or parboiled and chilled early in the day; on sandwiches; with grilled, roasted, or leftover poultry or fish; and even whisked into vinaigrettes for a slight creaminess. Like aïoli, mayonnaise is an emulsion: droplets of oil hang suspended in the egg yolks (and any vinegar or lemon juice used) in a homogeneous mixture. But mayonnaise is lighter in texture than aïoli. Mayonnaise’s foundation is neutral oil, like canola or grapeseed, with little distinguishing character. Like a white T-shirt and khaki pants, mayonnaise’s plain base needs dressing up. Enter acid in the form of wine vinegar or lemon, and seasonings that typically include dry or prepared mustard, salt, pepper, sugar, and maybe a pinch of cayenne. You can customize your mayo with fresh herbs — rosemary, tarragon, chervil, sorrel, parsley, thyme, marjoram, cilantro, or oregano — or you can add horseradish or spices such as smoky paprika and saffron. The list goes on with green onions, roasted red peppers or tomatoes, chopped toasted almonds, capers, anchovies, citrus zest, roasted shallots, jalapeños, and of course such 1990s trend classics as curry powder or puréed chipotle chiles. And yes, even garlic. Here’s how to make a mayonnaise by hand, with a whisk. Why the old-fashioned way? Because the bowls of food processors can be too large to emulsify small amounts, and not all blenders properly catch and mix the oil into the egg yolk. Oil is the main ingredient, so make it a good one. Pour a little into the palm of your hand and taste it. Does it seem stale? If so, it may be rancid. Is your olive oil sharp and grassy? That’s fine, but it could dominate. You may want to cut it with neutral oil. Your eggs should be fresh, preferably laid by chickens that get to enjoy some time under the sun. The vinegar should be worthy of a good salad and the lemon juice should be freshly squeezed. Finally, when both the eggs and  the oil are at room temperature, it is much easier to get them to emulsify. Get a heavy mixing bowl and place it on a damp kitchen towel or a tablecloth, so it doesn’t move. Choose a whisk that has thin, flexible tines. The whisk should have many tines, not just five or seven. If you’re using garlic, use a [/articles/features/mortarandpestle "mortar and pestle" newpage=true] to pound it to a paste. You may want to pound other ingredients in this ancient vessel to bring out their flavorful oils. This is especially helpful with softer herbs like chervil, or with any ingredient you want to emphasize or mash. Emulsification isn’t scary; it just requires patience. 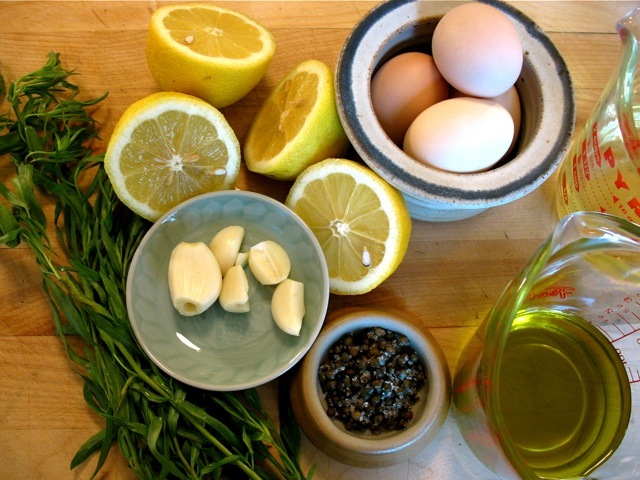 Whisk the egg yolks in the bowl until they loosen and lighten in color. This means they are ready to start absorbing the oil. Whisking can be done with a brisk back-and-forth motion, or in fast circles. I find back and forth much easier. Begin to whisk in the oil drop by drop. It’s helpful to use a liquid measure for slow pouring. You can move up to a thin stream once the mixture resembles the consistency of ranch dressing. This takes a couple of minutes. Continue until you have added all the oil. If the mayonnaise is too thick, thin it with a teaspoon or more of warm water. You’ll know it when you see it. When mayonnaise breaks, the eggs and oil refuse to come together into a smooth mixture. This happens because the eggs or oil were cold, because the oil was added too quickly, or because the whisking was not sufficiently vigorous. Julia Child called this a “turned mayonnaise.” Don’t take it too seriously, though. Anxiety does not aid the process. First, try whisking in a little warm water. If this doesn’t work, put another egg yolk in a clean bowl. 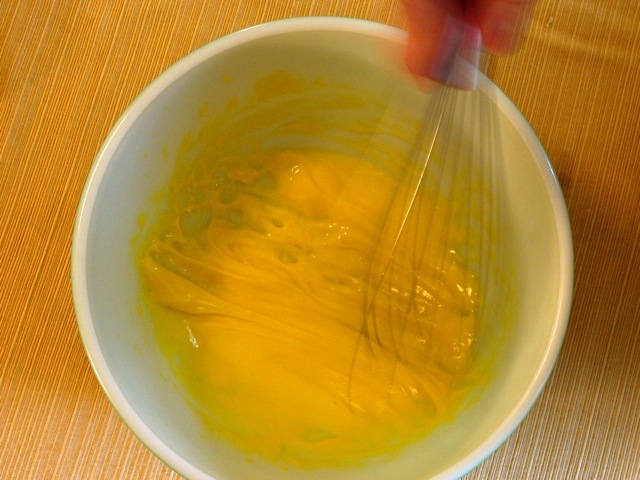 Then slowly whisk the broken mixture into the new egg yolk, drop by drop. Use a spoon to stir in any other ingredients you are using and check the seasoning. Judging the salt can be tricky. Add as much as you think is needed, then check again in 20 minutes. Salt is slow to dissolve in mayo’s thick fat. Besides salt, flabby mayonnaise often needs more acid and pepper. With a little practice, you won’t need to go to a restaurant to enjoy a sinfully delicious mayonnaise — er, aïoli. You’ve made your own summertime comfort food.